This Excel spreadsheet will calculate the viscosity of natural gas. 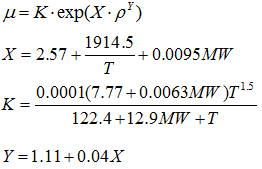 The spreadsheet uses the Lee, Gonzalez and Eakin correlation for the viscosity, and the CNGA (California Natural Gas Association) correlation for the compressibility factor. The Lee, Gonzalez and Eakin correlation, only requires the pressure, temperature and molecular weight of the natural gas, and is relatively accurate compared to more complex methods of predicting viscosity. It still widely used and accepted. Gas density is predicted by this correlation. 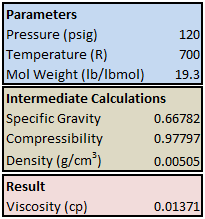 where ρ is the density in g/cm3, P is the pressure in psig, MW is the molecular weight (lb/lbmol), R is the gas constant (10.731 ft3 psi °R−1 lb-mol−1), T is the absolute temperature (°R) and Z is the compressibility factor.